A long time ago I animated all of the International Sport Kite compulsory figures using Flash. These animations became the de facto standard for competition kite flying – in fact some of the judges wanted them to be the official standard instead of the static diagrams. When Jobs and Apple decided to drop support for Flash on the iPhone and iPad it meant that people using those platforms couldn’t view the animations when they were in the field. Well, it’s taken some time, but I’ve now added HTML5 versions of the animations to all 123 pages (there are only 99 figures, but some the dual-line team figures are shown for 3, 4 and 5 kite teams). The conversions were done using Google’s Swiffy. It’s not a perfect conversion as for some reason the buttons to turn the grid and figure lines on and off didn’t work (so I’ve dropped them on the HTML5 versions), but at least all the fanboys will now be able to see how the figures are meant to be flown. I case you want to look, you’ll only see the HTML5 versions of the animations if your browser isn’t Flash enabled. 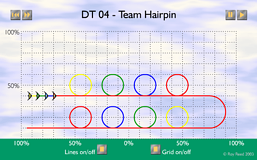 Edit 12/04/2013: I’ve added HTML5 functionality to my Kite Trick animations as well. This entry was posted on Tuesday, April 9th, 2013 at 5:34 pm and is filed under Kites, Web Design. You can follow any responses to this entry through the RSS 2.0 feed. Both comments and pings are currently closed.